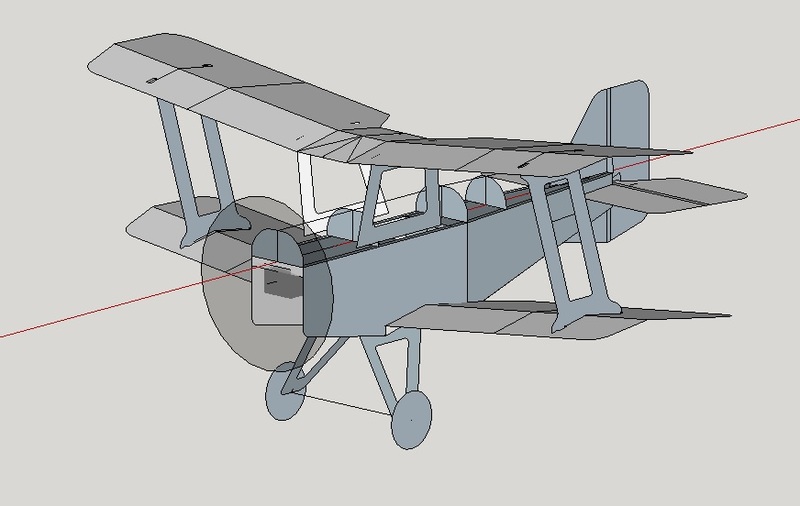 I have one scratch build project, Bristol Fighter F2b and receiving both criticism and other feedback, which I explained in my bio why it is hard for me to accept, but I do accept it and greatly do appreciate it, since there are no actual RC Plans for either the Bristol or the Nieuport 24, I've had to create it from sight of images of the plane or from videos done of flying replicas. Then my first one is the Nieuport 24 in a large scale, waiting for a proper scale to be bought to weigh it for proper power pack. Since I'm home bound, I have my dad pick up the foam board from Dollar General, small wood dowel rods the size of bbq skewers, tape and hot glue. Also I use the cardboard shipping boxes as well. My mom always said, "Andy never goes to do something small, when he does something, he does it big." The Nieuport without the proper measuring tools, it is a tad non center, but the Bristol is properly center. Just sitting at the dining room table, some old movie on from TMC or a Catholic Film on to listen to while I build, I'm enjoying the experience, even the ups and downs, plus the creating things when something doesn't look right or fit right. Since I can't travel well to large air shows, I turn to Youtube and watch the flights of the old planes on the Historical Aviation Film Unit and it is here that I saw these two world war one planes and wanted to build them for RC flight, also since in November is the 100th year Anniversary for the end of World War One, what better way to honor the World War One Aces than to build their planes and fly them. I'm sorry if I act rude to some comments, when I build, I do not intend to make them poorly, but want to do them right, but they are first two builds and working without actual RC Plans, and having to use the actual blue prints if I can find them, to make them into RC Planes, if no plans, then what I find in google photos or by the Youtube channel I watch to see them fly. I find that when I wish to build a particular model that no one else on FT has built I do some basic research and then go to https://outerzone.co.uk/browse_plans/ and find out what other people did in the past. Often I can use their exact dimensions and shapes to build that special plane. thanks @Hai-Lee only person at @flitetest did something simular to the Bristol, Jeremy who did his latest cartoon plane, for the lower engine placement. I don't see any of your responses as rude, instead I see you honestly letting us know how you feel based on the comments you receive. I do not intend to make them poorly, but want to do them right, but they are first two builds and working without actual RC Plans, and having to use the actual blue prints if I can find them, to make them into RC Planes, if no plans, then what I find in google photos or by the Youtube channel I watch to see them fly. As @Hai-Lee said, there are a number of options available to get plans. The hard part is how do you convert these to foamboard. So let me ask a couple of questions to determine how best to help you move forward with building the Bristol. The FT SE5 is almost identical to the Bristol although its a good bit smaller than where you seem to want to be. 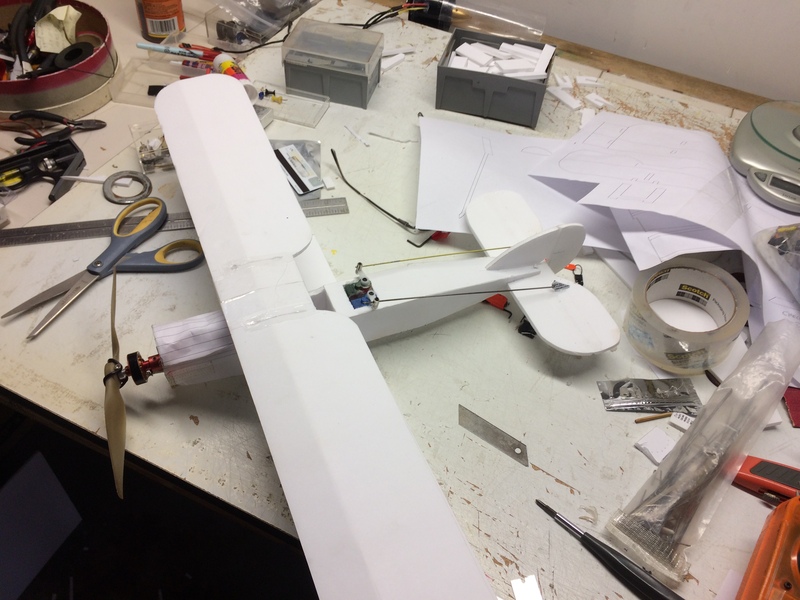 Are you in a position to build the SE5 from plans, that is, do you have access to a printer to print the plans out, glue them to the foamboard, and cut the parts exactly as laid out on the plans (do you have a straight edge ruler to cut along, do you use and exacto knife or similar to cut the foam)? If so, it would not be a huge amount of work to modify the SE5 plans to make the plane look like a Bristol, most of the changes would be cosmetic so you would base your design and construction on a tried and tested platform, but end up with the actual plane you wanted to build. Does this make sense? If, as your mother has said you need to do it bigger, then it is pretty straightforward to scale up the plans to fit your needs. yep got all the above now, just walmart doesn't have the special ink our printer needs, so will have to ask the John deere store that uses the same printer, where my dad works, to order it for us, which takes it time to get it shipped to us. I have the exacto knife, straight edge, 90 degree angle, a good metal yard stick. Great! So it sounds like you have everything you need except a way to print them out at the moment. In the meantime you could download the plans for the SE5 and study them while looking at the SE5 build video. That way you will ready to go when you can do the print outs. Let me know if you need help modifying the plans to look like the Bristol or scaling them up. I will be downloading them now, yeah I will be need the help in making it look like the Bristol, @DamoRC that engine placement has me stuck, that is why I haven't moved on my build on the first attempt of the Bristol. I think I can help with that, it depends on your tools available though. when I built my mustang, I built it without the kit, so I had to dremel and sand a bulkhead, it worked really well. if you have a Dremel or another effective way to cut and drill aircraft grade plywood, it makes a great bulkhead. You would just a have to trace out a bulkhead, drill some motor mount holes and then mount the motor on it. plus Flite test has plans for building bulkheads for their power pack motors on their website, I hope this helps. yep, got a dremel kit with the different heads. thanks. @JTarmstr this will help a bunch. I didn't know they had plans for the the bulkheads. oh, where do u get aircraft plywood? local hobby stores, or you can buy it online (I think), I bet other people have substitutes for it though. 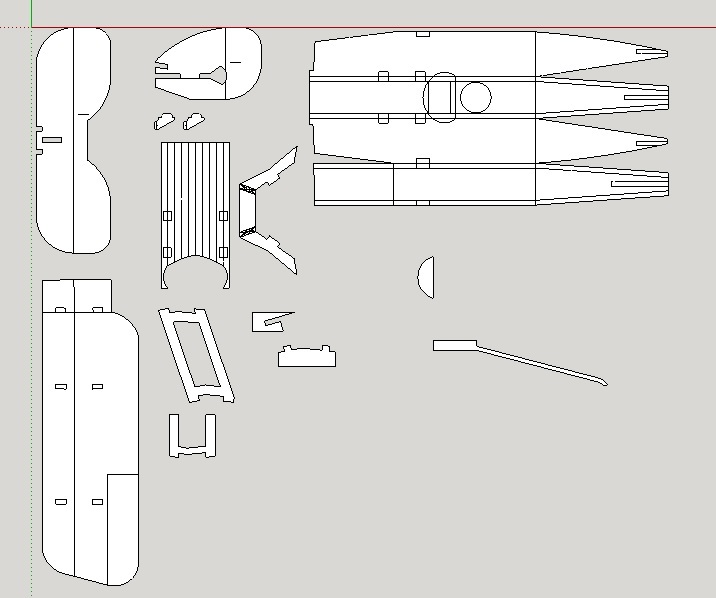 Also just a warning though they have bulkhead plans you might have to adjust them depending on your airframe, and it depends on whether you want to build it swappable or not. Awesome, when I saw and read aircraft plywood, what came to mind is what the British Mosquito bomber was made of. yeah, the mosquito was one of the last plywood fighter/bomber aircraft. wow, I was just wondering if it was the same material, I wonder how many sheets they used and how did they keep it light, so interesting. I dont think it was the same as the stuff we use now but it was definitely similar, the light weight is what gave the mosquito a incredible top speed and good resistance to damage. Any update on the printer ink? The motor position is never going to be perfect on this one because on the original model the prop shaft is right at the bottom of the fuse at the front and you won't be able to replicate this exactly with an electric motor. Had a look at the SE5 plans and vid to see what was needed to modify from the SE5 to make it look like a F2b. Then using a three view, created a model of the F2b that was constructed in a similar fashion. This is the same scale as the SE5 (24 inch wingspan). If you compare the FT SE5 versus a three view of the plane, they increased the wing cord, vertical stabilzer (VS), and horizontal stabilizer (HS) areas by 20%. 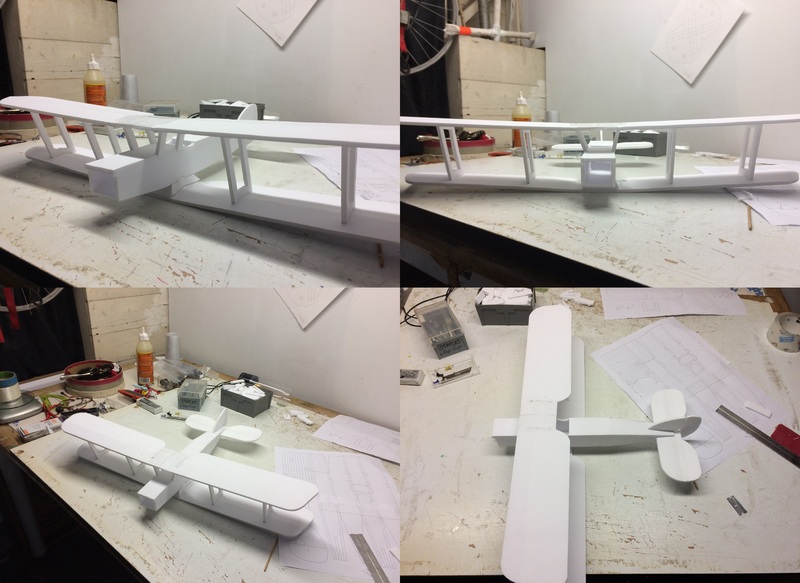 In this model I added 10% to the wing chord and HS and 20% to the VS.
Then unfolded so that I could print out a quick a dirty set of plans to see how the pieces would fit. All told she went together pretty well. Surprised at how robust the wing is. This airframe weighs 2.5 oz. Chucked her around a bit to see how she glides - pretty well - so decided what the heck, an threw a couple of servos and a light motor in there. All up with a 450mAh 3S is 7.5 ounces. Its rough, but it will be interesting to see if she will fly. well the big inkjet will take a while, will see if my college plug and print printer for the laptop will work. 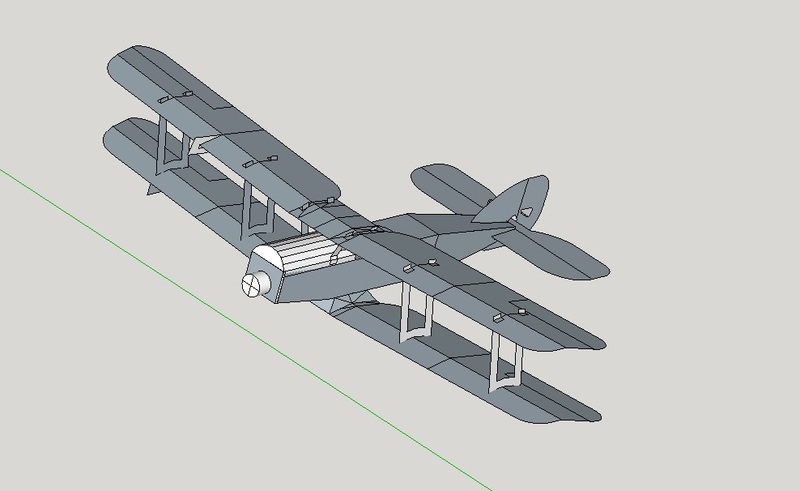 @DamoRC would it be possible to get both elevators on upper and lower wings to work on the real bristol and the college printer died while printing the first page.